A person with a disability may find it difficult or impossible to use the controls, hose or nozzle of a self-serve gas pump. Ensure safety and provide assistance at the gas pump for customers with a disability. 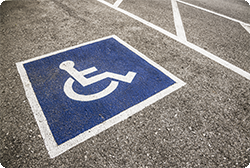 This online course mini-module reviews ADA requirements for self-serve gas stations and covers rules for handicap accessible signage at gas pumps. Managers and employees learn the importance of being alert and responding immediately to calls for assistance from customers with a disability.